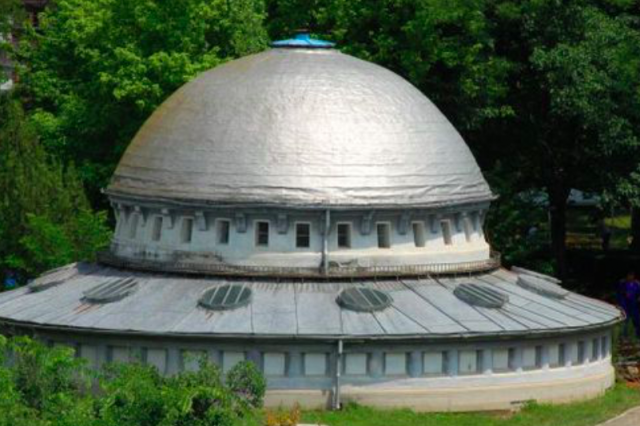 This photo of a parked ‘UFO’ in Romania has fascinated alien hunters for years, but they’ve missed one huge detail. The photo, showing a very UFO-looking object, has gone viral amongst the alien-believer community after notorious ET spotter Scott Waring made a video claiming it was left there by outerspace visitors. He failed to notice one thing though – the ‘ship’ is actually a water tower. Continuing on his theory, Scott goes on to say that the whole setting looks very suspicious. There are no doorways and there are no roads or paved walkways. Even though the houses look old and desolate, the buildings near the UFO…look old, probably made to look old on purpose to keep people away. Maybe they’re just old, Scott. But the Ufologist isn’t giving up just yet. He claims that the object’s 14.39 metre diameter is the perfect size for a classic space ship. For some reason, and in his defence, Scott uses Google Map’s dated 3D feature rather than the more useful street view, which would show a photo of the object rather than its topography. Unfortunately for him (and us), The Mirror have confirmed the alien spaceship is in fact just a building used for storing water.